Cooking: Whether you are buying tinned or dried, please wash them thoroughly before use. If buying dried, firstly, boil a litre and a half of water, add 2 cups of adzuki, bring back to boil for a few mins and then cover, turn off heat and let sit overnight. Or if you are in a hurry, do the above and simply leave in for 1 hour. When time is up for either method, always pour off water down the drain, rinse and start cooking. I usually make mine in a big batch and either freeze in portions or keep in fridge for 2-3 days. Firstly heat a small bit of oil in a large saucepan (about a dessert spoon) and heat. Add the stewing beef in batches and seal on all sides till grey. Remove beef and add onions with a little water and sweat the onions for about 5-10 mins. Add the barley, bay leaf, carrots, garlic, juice of the lemon, thyme and mustard and season with a little salt and pepper. Leave to sweat for a few minutes and add the beef and stock. Bring to a boil and then reduce to a simmer and cook for 1 – 11/2 hours, checking every now and then. If you feel the barley is soaking up too much liquid, add a little more stock or boiling water. 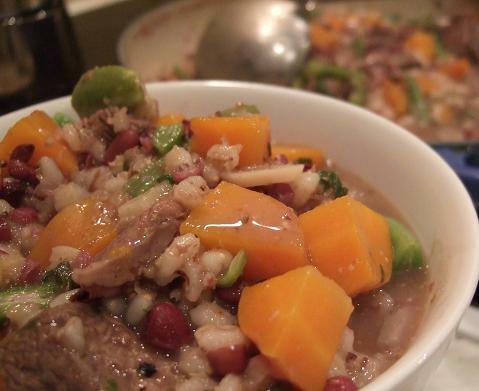 Cook until the beef feels quite tender and then add the cooked adzuki beans and french beans (if you are adding them). Stir well and check seasoning – you may want to add a little more salt or pepper at this stage. Cook for another 2 mintues. Serve straight from the pot into a large bowl!